International Talk Like A Pirate Day | I, Sarah, Take you. There were a few great parts to the day; 1.) all of my co-workers participating by wearing their and talking like pirates .and 2. )The photos that we took (which I won’t be posting just because I haven’t asked them if it’s okay) BUT-I think the best part of the day, hands down, was when someone called me at work saying, “ARRR!, this is Cap’N Pete from Pete’s Emporium”, I started laughing and said, “ahoy-hoy, what can I help you with?” and he replies, “oh nothing, I just wanted the chance to call you and talk like a pirate!” So, whoever you are, thank you for making my day. 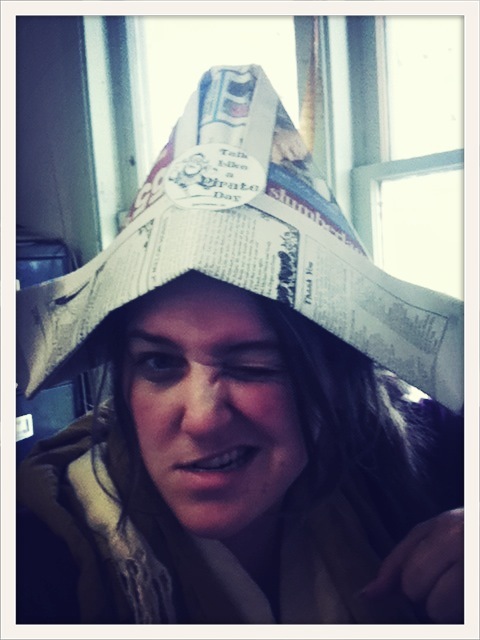 My day was truly filled with many, “Arrr”, “ahoy”, “matey”, and “scallywag” lovin’. On top of talking like a pirate, one of my co-workers so kindly pointed out that you can change your facebook to the language of ‘English(pirate)’. Go on, you know you want to do it. Everyone is a Cap’n and instead of clicking that you “like” something it says “Arr!” instead among many other great pirate words. A short post but such a good day that I had to say something about it. 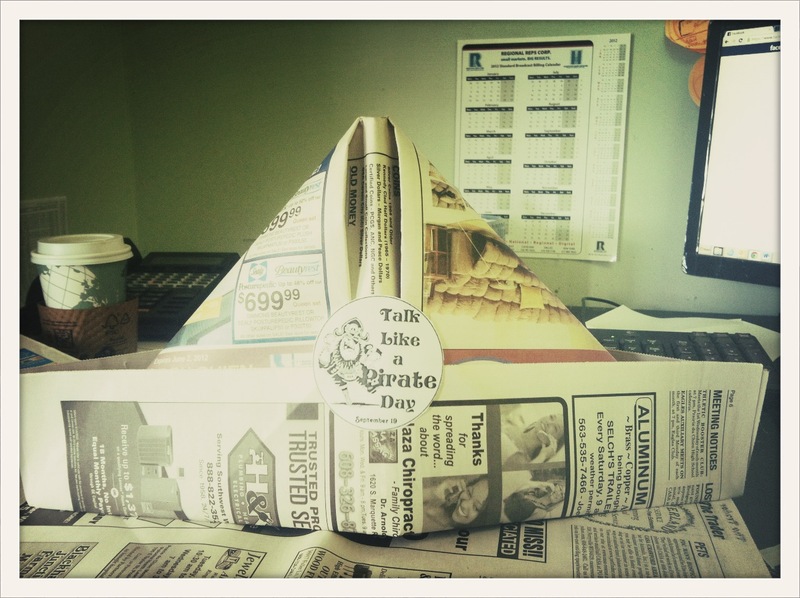 Who would have known that a bunch of newspaper hats would make so many adults happy? Thanks!! Had a blast!! The hats are real easy to make and if I would have had enough time I would have painted them black and put skull and bones on them!